There is no topic hotter than global warming. After all, Al Gore won the 2007 Nobel Peace Prize for his work in raising awareness, his movie ``An Inconvenient Truth’’ won an Oscar, and terms like ``carbon footprint’’ are now part of the common lexicon. There is no topic hotter than global warming. After all, Al Gore won the 2007 Nobel Peace Prize for his work in raising awareness, his movie "An Inconvenient Truth" won an Oscar, and terms like "carbon footprint" are now part of the common lexicon. So is green just the buzzword of the day? Is it a fad? And what does all this have to do with IT? Well, if you're virtualizing servers as part of a data center consolidation strategy, then you need to start thinking green. 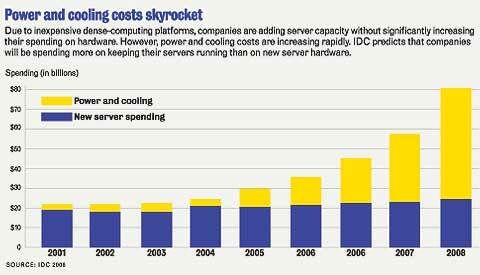 Specifically, you need to come up with a strategy for reducing data center energy costs. And it would be advisable to do so before your CEO or COO calls you in and asks what you're doing to help make the company more green and more energy efficient. The good news when it comes to green data centers (as opposed to global warming), is that the science is not in dispute and there are proven solutions. Information and communications technology accounts for roughly 2% of global CO2 emissions. Gartner analyst Simon Mingay has taken that 2% figure and broken it down by types of devices. The biggest culprit turns out to be PCs and monitors, which account for 39% of the CO2 emissions, followed by servers at 23%, fixed-line telecom at 15%, mobile telecom at 9%, LANs and office telecom at 7% and printers at 6%. While PCs and monitors are the biggest problem, they are the hardest to address because it’s difficult for IT managers to control end user behavior. For example, the ideal would be for all end users to put their computers in a low-power state at the end of the day, either "standby" or "off." Obviously, this not only helps with CO2 emissions, it also helps cut energy costs. According to Mingay, "If most people switched off their PCs and monitors after hours and made more aggressive use of power management features, then global CO2 emissions and related power costs from the operation of PCs could be cut by as much as 40%." Since data consolidation is resulting in concentrations of powerful servers and storage devices in one room, the data center is an obvious target for efforts to reduce energy costs. The EPA in 2006 said that U.S. data centers consumed 61 billion kilowatt-hours of electricity at a cost of $4.5 billion a year. So, clearly, if you could cut energy usage by a significant amount, you'd be saving real money. Numerous studies exist on power consumption in the data center. An Emerson Network Power study broke down data-center power usage this way: 50% for air conditioning, 26% for servers/storage, 11% for communications equipment, 10% for power-distribution equipment and 3% for lighting. A 2006 white paper from the American Power Conversion Corporation came up with similar conclusions: 48% for cooling systems (33% chiller/cooling tower, 4% humidifier and 11% air conditioning); 30% IT equipment; and 22% for electrical systems (16% UPS, 4% power distribution, 1% switching and 1% lighting). Both studies agree that cooling is the big culprit. Best practices for data center cooling and heating calls for a scenario in which cool air flows from bottom to top. In other words, create cold aisles and hot aisles, push cool air up through vents in the floor and push hot air out through ceiling vents. If you can't afford to revamp your data center with raised floors and new venting systems, a simple decision to keep the ambient temperature between 70 and 74 degrees can help. Nobody said the data center needs to be as cold as a meat locker. Beyond those types of fixes, it's probably a good idea to make energy efficiency a part of every buying decision from now on. That includes everything from servers, storage and networking gear, to communications devices, to printers, PCs and monitors. And, when IDC surveyed IT execs on green IT, 43% said they consider a vendor's "greenness" when selecting their suppliers. And 80% said green IT is growing in importance in their organizations. Bottom line: Think green to save greenbacks.